I found this picture about a week ago on an iphone app called "whisper". Its an app where you can anonymously create a picture (either upload, or choose from database) and type your own text. This is a screen shot of it from my phone off of the app. When i first read it i was shocked. And now the impact of how big this secret is, truly hit me. Last edited by hoi.polloi on Thu Jan 31, 2013 3:31 pm, edited 2 times in total. Re: Creepy 9/11 hoax proof picture? Uh, this implies someone in the tower was real but it doesn't say who? Seems like a cheap gimmick to get people emotionally invested in vicsims. Also, you snapped this at 2:09? Really? To me it shows that this person may have left someone and diapered from their life in order to carry out the government oriented hoax. Sounds like someone faked their own death. And yes, i have a wondering mind that doesnt allow me to sleep much. y0lked wrote: To me it shows that this person may have left someone and diapered from their life in order to carry out the government oriented hoax. Sounds like someone faked their own death. And yes, i have a wondering mind that doesnt allow me to sleep much. This looks more like the content of diapers. It's a variant upon those so-called Internet 'memes', where some witty comic (or backroom doublethink perp-pulp producer) churns-out an over-used viral visual archygraph, overlaid with a snappy two-liner. Try digging around for earlier instances of this particular cropped/annotated....cartoon. AmaZing how these things come about,he's alive but where the hell is he? Is he trying to reach the outside world.? Just another clue of deception maybe! 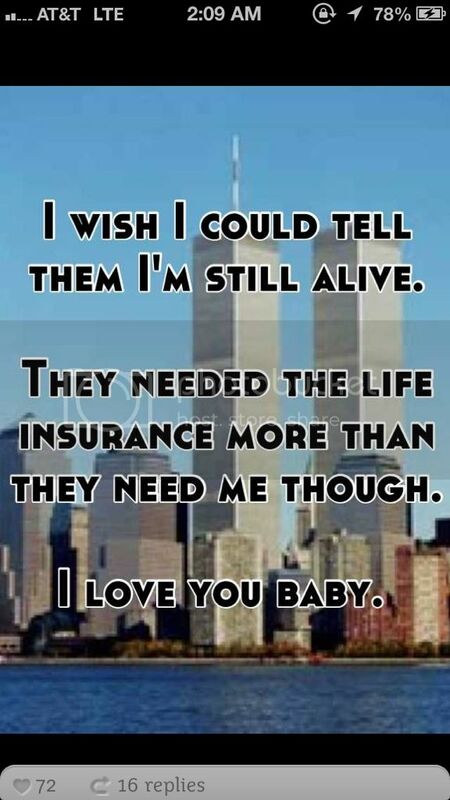 Actually,was there a surge on life insurance after 9/11? Last edited by Aussie Charles on Tue Apr 09, 2013 12:08 pm, edited 1 time in total. Aussie Charles wrote: AmaZing how these things come about,he's alive but where the hell is he? Thanks for your intelligent contribution. Why don't you just stop. It's my administrative duty to ban you. Sorry.